UK Release Date - 24th April 2008. US Release Date - 24th April 2008. Live Tracks 02/03 - Location unknown but likely the 2006-2007 tours. GER Record Label - Island/Mercury. Special Formats - Xbox 360 'Track Pack' download featuring two live tracks. The first single from 'Songs From The Sparkle Lounge' was released in April 2008. 'Nine Lives' featured guest co-lead vocals by country artist Tim McGraw who also co-wrote the track. For the first time the single was released via a video game. The song was made available as a downloadable Def Leppard 'Track Pack' for the Xbox 360 game console. The song could be downloaded for use on the Guitar Hero III: Legends Of Rock game. Also included in the pack were two classic live songs recorded in 2007. The total size of the pack is 56MB. The only CD version available for the single were UK and US promo CDs. 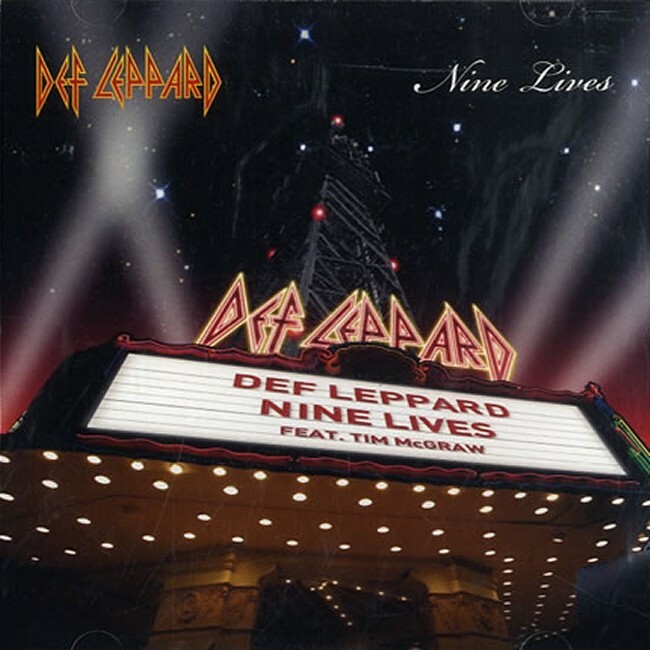 Two versions had the 'Nine Lives' artwork as the cover. The UK had printed artwork on the CD and came in a slim jewel case. One US version came in plain paper sleeve only the other in an album jewel case. The US CDs were both plain silver watermarked CD-Rs. Three hard rockin' Def Leppard tracks will be made available for Guitar Hero III through Xbox LIVE Marketplace from 24 April. The Def Leppard Guitar Hero III content is exclusive on Xbox 360, and includes the barnstorming new single "Nine Lives". The song pack also features Def Leppard classics "Rock of Ages" and "Photograph" from their ground breaking 1983 album Pyromania. "Nine Lives" will in fact make its worldwide debut via Guitar Hero III on Xbox 360. So if you're a Def Leppard fan through and through this is an opportunity not to be missed, and don’t you know it! The complete Def Leppard Guitar Hero III package will stay exclusive to Xbox LIVE Marketplace for 14 days from 24 April. The 10th Def Leppard album, "Songs from the Sparkle Lounge", is only a few weeks away now. It's the first original album from Def Leppard since 2002 and features the riff-tastic talents of Phil Collen and Vivian Campbell on lead guitars, Rick Savage on bass, Rick Allen on his high-tech drums and the mighty Joe Elliott up front on vocals. It's absolutely classic Leppard from the opening wall of sound. Playing along to "Nine Lives" in Guitar Hero III will be your first taste of what's to come. The Def Leppard Guitar Hero III song pack for Guitar Hero III costs 500 MS points. "Being involved with Guitar Hero is very exciting for us and adds a whole new layer of appreciation." "I know from personal experience how much more you get into the music by playing the game - which is why we were keen to explore this opportunity. GUITAR HERO is extremely popular with all kinds of music heads, which includes a lot of our fans - and we think releasing 'NINE LIVES' this way first is just fantastic!"